A great marketing campaign combines powerful imagery and a consistent message. 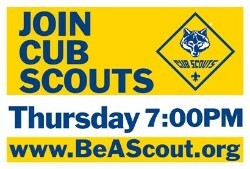 This year we are excited to showcase the "Scout Me In" recruitment campaign. Marketing materials include fliers, posters, web banners, custom emails, social media images, postcards, and much more. Additional resources are available on the Marketing and Membership Hub. Online RegistationInstruction on how to use the online registration system. Members can fill out the registration form online, but your unit needs to have it setup. There are also instructions so that Packs can select to be a family pack and enroll both girls and boys. Cub Scout Recruitment GuidebookAll you need to know about running a successful recruitment event! Complete with scripts for meetings. Online Membership ApplicationsHow to process applications using the new online registration system. Marketing for School Night is most effective when it utilizes multiple platforms. Whether it's coverage in your local newspaper or an online recruitment campaign, packs should take advantage of every opportunity to promote themselves. Lots of resources are provided by the Cornhusker Council for your use. Please work with your district staff to secure them. Items include: yard signs, posters, flyers, buddy cards, temporary tattoos, bookmarks and more.